Researcher, Innovator, Author, Speaker, Adjunct Professor, Security Architect & Adviser, Leader, Entrepreneur, Founder, Executive. Information Security, Software Security, Cybersecurity, Machine Learning, Artificial Intelligence. 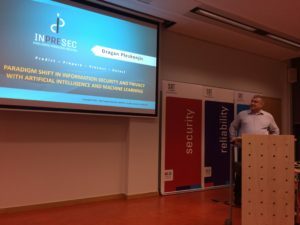 Current research and development focus: Intelligent Predictive Security (INPRESEC) – exploring the paradigm shift in Information Security and Privacy with Artificial Intelligence and Machine Learning. Interested in to learn more? Visit events page and contact me. High-tech entrepreneur with a strong background in information security, computer systems and networks security, software and application security as well as profound knowledge of wireless networks and systems, software development methodologies and architectures. Proven leadership and talent for creation, management and organization of successful teams. Initiated and has held leading positions in a number of industry projects, as well as in research and development projects. Experience in mergers, acquisitions, company integration and start-up companies. Experienced leader, has worked on set of top positions at international companies with global coverage, including positions of CEO, CTO, CISO, COO, Senior Director Information Security, Senior Director Technology, Head of Research and Development, Software Development Manager, Director of ICT and similar. 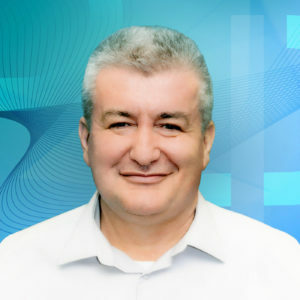 Possesses excellent theoretical knowledge and has been leading research and development in both academic and industrial sector which is well connected and aligned with professional work and best practices in companies, organizations and institutions. Adjunct professor. Published ten books and over sixty papers at technical and scientific conferences, seminars and journals internationally, including IEEE and ACM events and publications. Reviewer for scientific and technical journals, conferences and papers. Cited and quoted. Inventor of set of granted patents. Mentor at Founder Institute and Startup Academia. I have been honored with the designation of IEEE Senior Member since 2017. I received Senior Member Grade at IEEE (Institute of Electrical and Electronics Engineers). Senior Members August 2017 list is here. IEEE Senior Membership is an honor bestowed only to those who have made significant contributions to the profession. 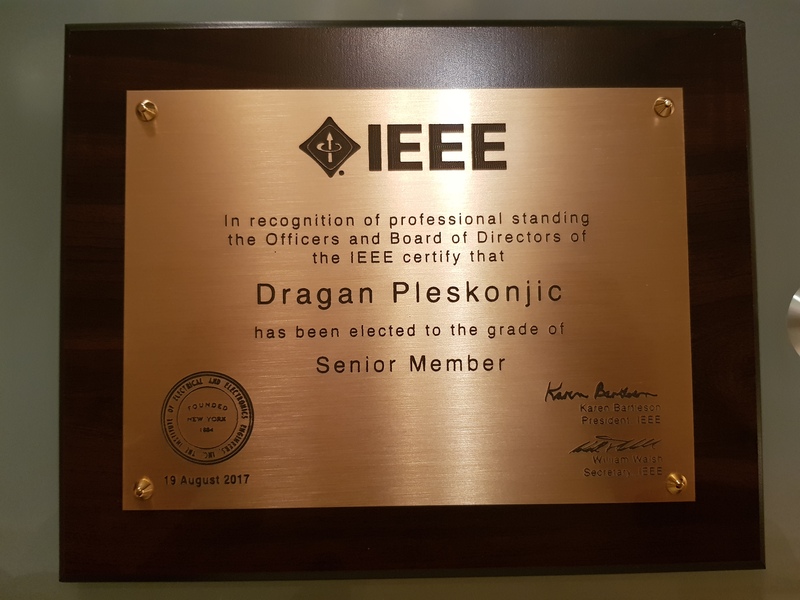 Senior member is the highest grade for which IEEE members can apply. Thanks to all who supported me to get this grade at IEEE. I have been honored with the designation of ACM Senior Member. I received Senior Member Grade at ACM (Association for Computing Machinery). Senior Members 2010 list is here. The Senior Members Grade recognizes those ACM members with at least 10 years of professional experience and 5 years of continuous Professional Membership who have demonstrated performance through technical leadership, and technical or professional contributions. Thanks to all who supported me to get this grade at ACM. PCI ISA (Payment Card Industry Internal Security Assessor), PCI Security Standards Council. I lead the initiative for localization of CrypTool to Serbian language. CrypTool localization to Serbian language. CrypTool is a free, open-source e-learning application, used worldwide in the implementation and analysis of cryptographic algorithms. It supports both contemporary teaching methods at schools and universities as well as awareness training for employees and civil servants. [Serbian] Na moju inicijativu, CrypTool lokalizovan na srpski jezik od strane studenata VIŠER. CrypTool je besplatni softver otvorenog koda za elektronsko učenje kriptografije, koji se koristi širom sveta za učenje, implementaciju i analizu kriptografskih algoritama. Podržava kako savremene metode učenja u školama i na univerzitetima, tako i treninge za podizanje svesti o sigurnosti kod zaposlenih i službenika u preduzećima, raznim organizacijama i institucijama.